Monstrous tentacles about to scuttle Ames' research ship. Nobel prize winner Crandall Ames, accompanied by aid Karyl Simmons, convinces Nelson to put to sea in an attempt to retrieve what he claims is his discovery, a life-extending and restoring agent he calls Vital Synthesis. It lies at the bottom of the sea in his recently wrecked research ship. 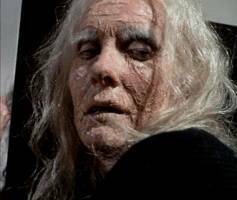 What he doesn't tell Nelson is that the ship was sunk by a gigantic Portuguese man-of-war, that Karyl, his love, is actually hundreds of years old, the beneficiary of Vital Synthesis, and that without her supply of the stuff, she has begun to age. As they approach the wreck site, Karyl remains locked in her quarters so no one can see her degeneration which progresses at an alarming rate. 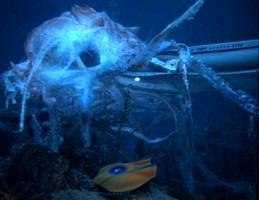 Meanwhile, Crane reports an ocean bottom strewn with wrecks and Seaview experiences electrical equipment failure, caused, unknown to Nelson and company, by the proximity of the monstrous creature. Once at the wreck, the creature attacks and is driven off by Seaview's force field. Damage is repaired and Crane orders them out of the area. 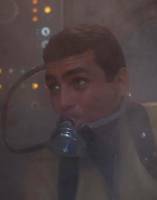 Ames, desperate to retrieve his sample and notes from the wreck, scubas out, only to be trapped in a crevice by the creature. Crane's attempt to distract the beast using the Flying Sub backfires and he, in it, winds up on the bottom of the sea. The desperate Ames manages to return to Seaview and claims Crane is expendable, that they must rescue his Vital Synthesis and associated notes. Nelson, needless to say, is not so moved. 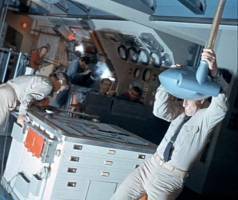 While he makes plans to use Seaview's parabolic antenna to reflect the creature's energy back on itself, Ames locks himself in the missile room, readies a torpedo for firing at the creature, and arms a weapon, which will soon go off if Nelson doesn't accede to his wishes, regardless of Crane's precarious position. Nelson refuses to fire the torpedo -- the concussion would probably kill Crane in the Flying Sub. But after warning Crane to be ready to make a quick exit, Nelson heads for the creature and uses Seaview's parabolic antenna to drive it off. When Crane comes aboard in the missile room, he's captured by a gun-toting Ames. The monster attacks again and in the commotion, Ames drops his gun. Crane overpowers him and is able to fire the torpedo into the creature, killing it. He then defuses the timed weapon. 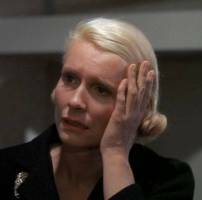 All of Ames' obsession turns out for naught -- he rushes to Karyl's quarters, and she, now incredibly aged, falls into his arms and dies. Voyage Fan Ray Westafer points out that "ten years after Graveyard Of Fear, Space: 1999 did a rather epic, documentary-style episode entitled Dragon's Domain. The basic format of an alien encounter in space, leaving one crew member to tell a doubtful Earth was later used in 1979's Alien. 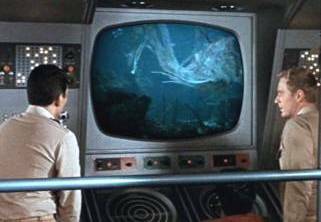 Dragon's Domain's most memorable scene is of the Ultra Probe spacecraft's initial encounter with a tentacled monster in a graveyard of ships. Sound familiar? 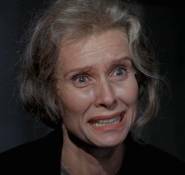 Irwin Allen was very much taken with Marian Moses and impressed by her performance in "Graveyard." At left is an ad that appeared in the Hollywood Reporter calling Television Academy members attention to the performance of Marian Moses in the Voyage episode "Graveyard of Fear," and suggesting her nomination for an Emmy. It read: Irwin Allen calls to your attention the outstanding performance of Marian Moses in "Graveyard of Fear" on Voyage to the Bottom of the Sea. Sunday Jan 30--7:00 p.m.--Ch. 7. Graphic courtesy of Linda Adams..
Mark Says: A perfect blend of The Portrait of Dorian Gray and giant jellyfish blues. Everything works here, including the jellyfish effects. 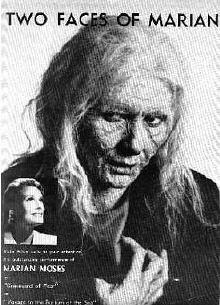 The old-age makeup on Marian Moses is top-notch and Robert Loggia does well as the scientist driven by desperation. Exciting and dramatic, this is one of the all-time classic Voyages. Mike Says: Yes, everything works. The story has power and a sense of desperation that lends the affair credibility once you get past the fountain-of-youth premise. The writing, although not brilliant, is certainly adequate. The acting is virtually flawless and the special effects are particularly good. 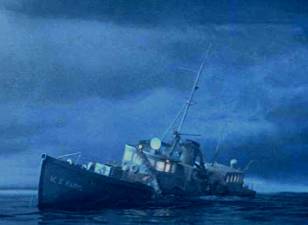 The music cues, mostly taken from Jerry Goldsmith's soundtrack for "Jonah and the Whale," resonate perfectly. 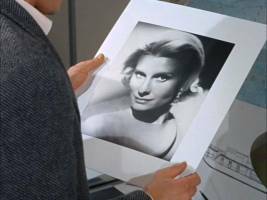 This was Voyage's highest rated second season episode, garnering a very respectable audience share of 35. Boy, if you've got a 35 share today, you own the world. I agree with Mark -- this truly is a Voyage classic.